A few months ago, Cheryl Cole launched her very first fragrance – now if that isn’t the sign of a celeb who has branded themselves impeccably well, then I just don’t know what is! So many celebrity fragrances can be a bit of a let down, all kind of smelling the same, so I was pleased to find the StormFlower fragrance to be surprising change from the run-of-the-mill celeb fragrances! At the launch event Cheryl told how she had dreamt of a ‘fresh’ fragrance, and the name StormFlower was inspired by the fresh feeling after a storm. Cheryl admitted that she had had an influence over everything from the bottle design, the adverts, and of course the fragrance itself. Guests at the event were kindly given a bottle to take home, and so I’ve been testing out StormFlower for some time before writing this review. The first thing I love is the bottle. The delicate yet exotic flower design in gold is elegant and not at all tacky (like some celeb fragrances!) It’s available in three sizes, 30ml, 50ml and 100ml and they don’t break the bank, ranging from £23.95 to £39.95, and they are also launching a body wash (£14.95) and a shimmering body lotion (£17.95). 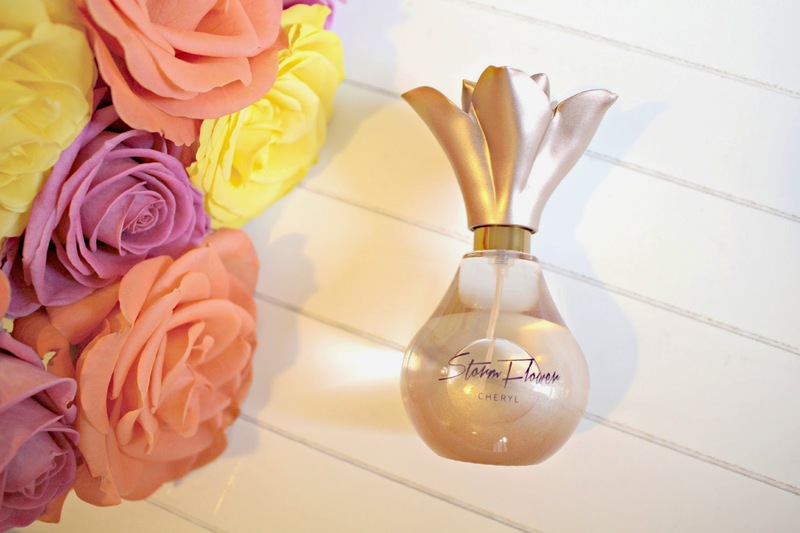 With it’s soft, fresh fragrance, StormFlower is the ideal daytime perfume. It is mostly fruity, with notes of mandarin and nectarine, without being too orange-y. The unusual floral notes from the freesia and peach blossom make it modern, and my favourite vanilla element adds a sweet touch, while the white musk and sandalwood make the fragrance warm and musky. With a more grown-up fragrance than I had originally anticipated, the smell also lasts for most of the day – I can imagine that if you use the body wash and lotion it would add to this too, and make more intense if you were to wear it in the evening. Overall, this fragrance has completely surpassed my expectations – far from the usual celebrity samey type perfume, Cheryl’s StormFlower is elegant, modern and fresh. Several people who have asked me what perfume I’m wearing have met me with raised eyebrows when I’ve told them that it is Cheryl’s. My usual favourites include Victor & Rolf, Flowerbomb, and Juicy Couture’s Viva La Juicy, so if you like those kind of warm, everyday fragrances, then you should definitely find this and give it a try. It’s out now, and you can buy it from The Perfume Shop and find it in Superdrug stores. Have you tried Cheryl’s StormFlower? Were you as shocked as I am? !